And so we come to episode eight in the ongoing Fast and Furious franchise, the series that just keeps on giving and giving… and giving and giving and giving and giving. This is a movie, one of several that we’ll see this year, that will do incredibly well at the international box office, and which will be hugely successful no matter what critics or bloggers or anyone and their auntie says about it. It’s a movie that exists in its own little cinematic bubble, oblivious to movie making trends, advances or developments. If you live in the UK, it’s the equivalent of those Ronseal adverts that state, “It does what it says on the tin”. And if you don’t live in the UK, then try this comparison: it’s like going to McDonalds and ordering a Big Mac, fries and a Coke. You know exactly what you’re getting, and it doesn’t matter if you’ve had that particular combo more times than you can remember, that’s also kind of the point. Here, familiarity breeds expectation, and the makers of the Fast and Furious movies know exactly how to satisfy that expectation. All the familiar elements are here: exotic locations (Iceland, Cuba, New York? ), Diesel being taciturn and glowering a lot (he even shouts a few times, which is new), Johnson looking like a poster boy for steroid abuse, Rodriguez glowering a lot like Diesel, Gibson acting unconscionably stupid, Bridges giving nerds a fairly good name for once, over-the-top action sequences that regularly and deliberately challenge the laws of physics, and cars, lots of shiny, sleek, expensive cars. Relative series newbies Russell, Emmanuel and Statham slot in neatly amidst the rest of the cast, while complete newbies Eastwood (good guy) and Theron (bad guy) add little and a lot respectively. Throw in some old faces from previous entries, and a storyline that’s been built on the back of the last two outings, and you have another patchy, under-developed crowd-pleaser that does enough to keep its audience interested while at the same time giving said audience very very very little that’s new. And it’s the opener for a closing trilogy of movies that will see the franchise come to an end in April 2021. If there’s anything interesting about the movie, it’s the way in which it harkens back to earlier entries, and tries to incorporate the look and feel of those earlier movies. The opening sequence, set in Cuba, is a throwback to the approach and feel of the first and third movies, with its street-level, underground racing vibe, and beautiful hangers-on to some of the ugliest drivers ever seen on screen. There’s a car up for grabs, a sneering minor villain who thinks he can outwit Dominic Toretto (foolish man! ), and some very impressive stunt driving. But it’s a measure of how far the series has come in terms of its tone and style, that this sequence – which starts off well – soon descends into the kind of ridiculous, credibility-free, and excessive action set-piece that the series has become known for. Seeing Toretto winning the race in a stripped-down junker, in reverse, and with the engine on fire no less, serves as an acknowledgement that while the series wants to honour its more scaled-back origins, it’s grown too big and excessive to be able to. Much has been made of this movie’s main storyline – Toretto betrays his “family” – but as a plot device it’s one of the weaker ideas in the series, and all because we know that there’s no way it’s “for real”. As expected, there’s a reason for his “betrayal”, and while it’s played out with as much sincerity as returning scribe Chris Morgan can instil in his by-the-numbers screenplay, it shows a complete disregard for the character of Letty (Rodriguez) and the trials she’s endured since “dying” in part four (and especially in relation to a scene between Letty and Toretto early on in Cuba). Worse still, the whole thing leads to a scene involving Statham’s returning nemesis Deckard Shaw, and the complete reversal of his character from murderous psychopath to genial funster. It’s as if the makers have seen his performance in Spy (2015) and thought to themselves, how can we exploit this? Character assassination apart, the movie follows the tried and tested formula of the previous three movies, and never deviates from its cookie-cutter approach. It’s no secret that the franchise thinks up its action sequences first and fits a story and plot around them later, but this time the obvious nature of such a design is even more noticeable than before. An attack on a Russian minister on the streets of New York occurs at the halfway mark, and includes the appropriation by über-villain Cipher (Theron) of any car in the area that has an on-board computer system. Why she has to activate all of them makes no sense, but it does lead to mass collisions and vehicles falling from multi-storey car parks and no end of unconvincing CGI. Far better? The scenes predceeding this where Toretto has to escape Cipher’s surveillance in order to put his own plans into action. Short, simple, and so much more effective. One thing The Fate of the Furious does get right – finally – is its choice of villain. 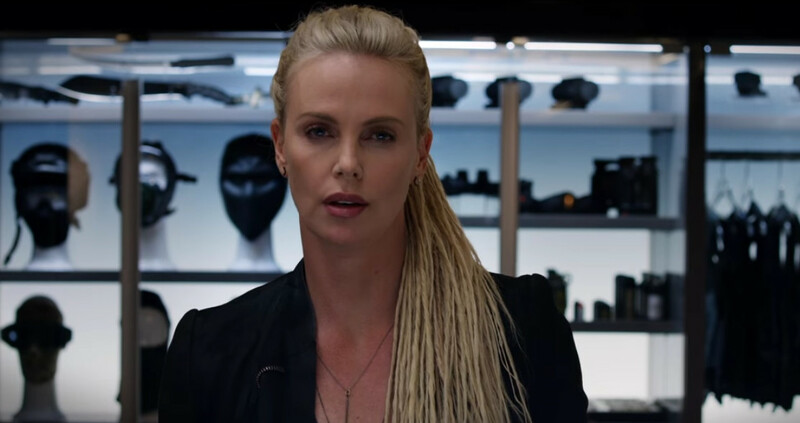 Stepping out of the shadows no one knew she inhabited, Cipher is played with chilling conviction by Theron, and if as seems likely, she’s going to be the villain for the last two movies as well, then her involvement could be the best thing about them – as it is here. With Statham’s character now reformed, the movie needed someone to be a real villain, and Theron comes through in spades. She’s icy, mad, and bad to the core. Theron shares most of her scenes with Diesel, and every time it’s a no contest: she acts him off the plane Cipher uses, and off the screen as well (which is a shame, as away from all his franchise movies, Pitch Black (2000) excepted, he can be a very good actor indeed). But what about those action sequences? And what about that submarine smashing through the ice? And all those explosions? Everything we’ve seen in the various trailers? Well, they’re all as slickly produced and homogeneously exciting as those in previous entries, and they’re fine examples of modern day action heroics, but even so they remain curiously thrill-free. 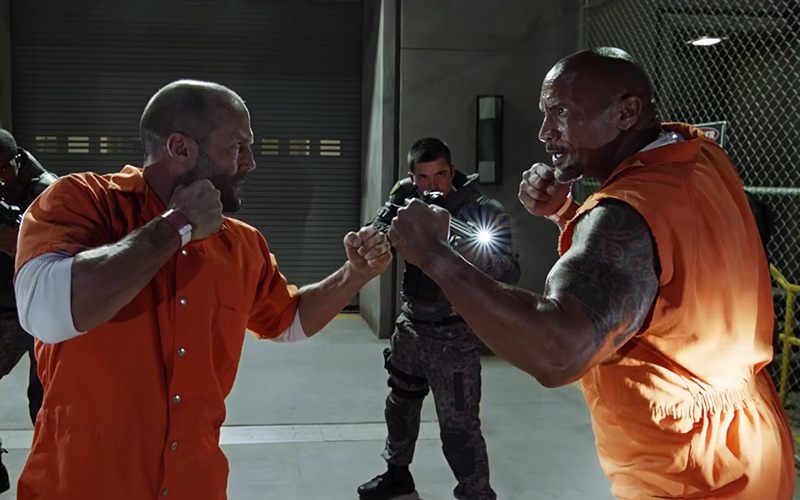 A prison riot does Statham and Johnson no favours thanks to having been shot in a jerky, shaky style that makes focusing on the various punches and kicks both actors dish out quite difficult to follow. It’s a sequence that could have benefitted from having a few more bone-crunching sound effects thrown in as well. The submarine sequence is reminiscent of the ending to Furious 6 (2013) (justly famous for its neverending runway), but is surprisingly restrained for all that, while the movie’s biggest explosion – naturally saved for last – also gives rise to the movie’s most ridiculous and risible moment. But none of this matters. Not Helen Mirren’s awful Cockney accent, not Hivju’s distracting resemblance to a young James Cosmo, not even the sight of Johnson manhandling a torpedo as it races across the ice. The Fate of the Furious can do what it likes and audiences will lap it up regardless. Does this make it a bad movie? On the whole, yes, it does. But for all that, is it entertaining? Weirdly, yes, but in a subdued, stopgap kind of fashion, as if this entry in the series was a bridge between previous episodes and the ones to come, ones that will (hopefully) up the series’ game considerably. After eight movies the franchise has reached a kind of tipping point: the final two outings need to be much stronger and more focused on what they’re trying to do. The series hasn’t quite run out of mileage yet, but it’s running perilously close, and if the makers aren’t careful, the remaining movies will most likely be running on fumes. 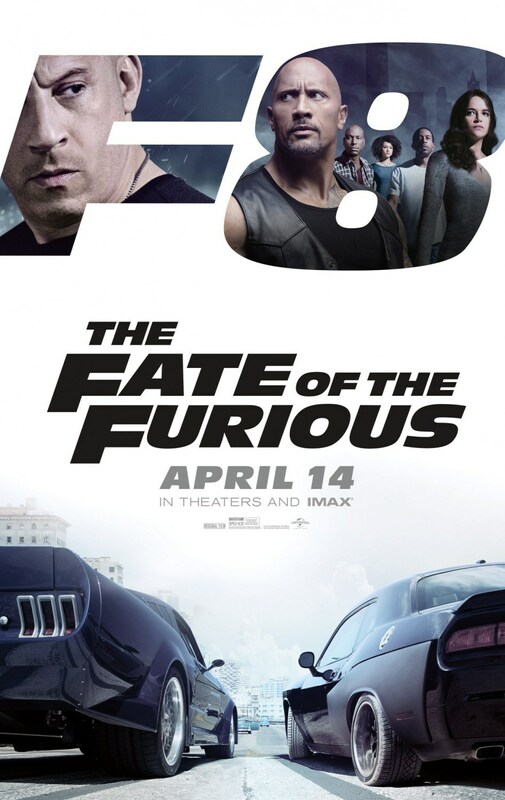 Rating: 5/10 – fans will lap this up, but The Fate of the Furious, with its tangled ideas about family and betrayal, doesn’t add up to much, and relies too heavily on its action sequences to prop up its awkward script; the cast have to make do with the same character beats they’ve been given in previous movies, and franchise first-timer Gray isn’t allowed to do anything different with the formula, making this a movie generated and made by committee, and as a result, lacking a distinct identity to make it stand out from the rest of the series. Arriving at the Deepwater Horizon oil rig site in the Gulf of Mexico to learn that certain safety checks haven’t been carried out, general operational supervisor “Mr Jimmy” Harrell (Russell) and chief electrical engineer Mike Williams (Wahlberg) find themselves at odds with BP executive Donald Vidrine (Malkovich) who is advocating that drilling continue despite the absence of these checks. With many more of the crew of the rig expressing their concerns, Vidrine pulls rank and the drilling resumes. Pressure begins to build in the pipeline, and further signs point to a dramatic, and likely, system failure. When it does, a massive blowout ensues, and the resulting explosion causes tremendous damage to the rig, threatening the lives of everyone on it. As fires rage all around them, the workers’ attempt to evacuate the rig. Williams finds himself rescuing several of his colleagues, including “Mr Jimmy” who has been badly injured. With the Coast Guard racing to the rescue, and with no guarantee that the fires won’t cause the rig to sink, Williams et al must rely on their own ingenuity in order to get to safety, while the world looks on at what will become the worst environmental disaster in US history. 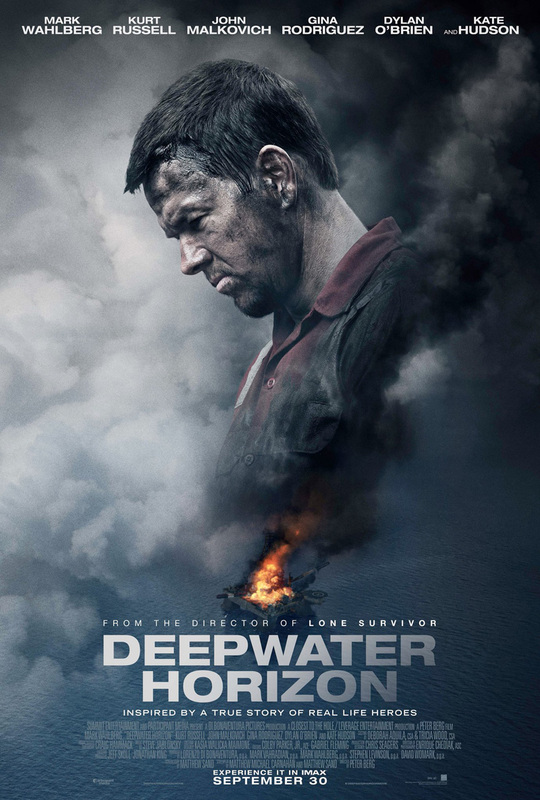 Watching Deepwater Horizon‘s first forty minutes, with its depictions of bubbling air pockets within the drill shaft, and the pipe itself shifting in protest against the pressure being exerted on it, it’s not hard to find a degree of anxiety about what’s going to happen creep up on you. It’s during this stretch that director Berg, aided by editors Gabriel Fleming and Colby Parker Jr, ratchets up the tension as he sets the scene for what we all know will be a nightmarish tale of survival. He also does a good job of introducing the main characters – along with principal supporting character, “Mr Jimmy”‘s moustache – and making us care about them. But once the oil hits the fan and fire takes a hold of the rig, the movie takes a strange left turn and becomes a standard men-in-peril movie where it’s hard to distinguish who’s doing what, where and how. Inevitably, the movie regales us with moments of sacrifice, heroism and incredible fortitude, but it also features various stock elements, such as Hudson’s anxious wife stuck at home watching it all unfold on TV, and Malkovich’s suitably oleaginous BP executive looking sheepish as he gets in a lifeboat. While it’s easy to see why Berg has included these moments, it’s the way in which they help dissipate the tension established earlier on that proves problematical. It’s equally unhelpful that despite all the pyrotechnics and practical effects on display, Deepwater Horizon feels at times like an extreme, sea-based version of The Towering Inferno (1974). It makes for a distracting viewing experience (even if it wasn’t Berg’s intention). That said, the performances are uniformly good (though Malkovich’s accent is distracting), and the script manages to avoid too much foreshadowing (e.g. “I can’t wait to get home and see my newborn child”, from someone who’s clearly going to snuff it). 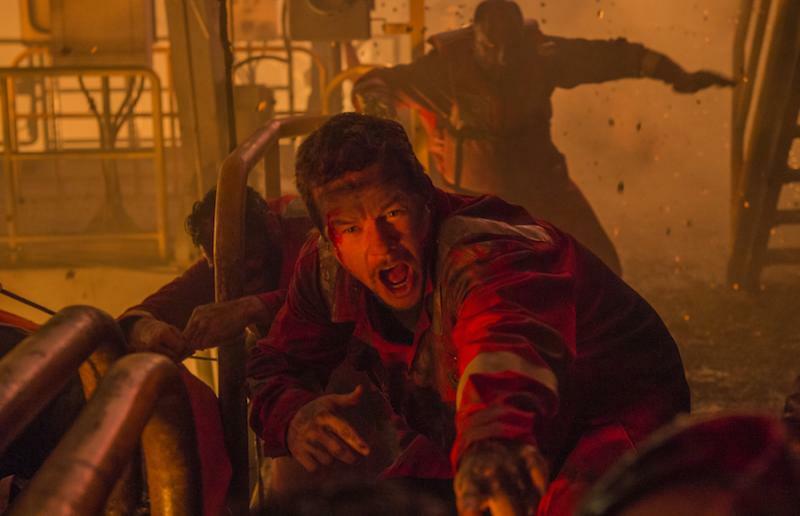 Rating: 7/10 – curiously uninvolving once things go from bad to staggeringly worse, Deepwater Horizon is a visually impressive retelling of an incident that BP would probably like to forget about completely; but spectacle without a human element to guide us through it is just that, spectacle, and the movie never finds an answer to the way in which it shifts down a gear after such an effective opening. It’s post-Civil War Wyoming, and a stagecoach trying to outrun a fast approaching snowstorm (in already treacherous weather) is stopped by an unexpected encounter with a bounty hunter, Major Marquis Warren (Jackson), stranded on the road to the nearest safe haven, a staging post named Minnie’s Haberdashery. 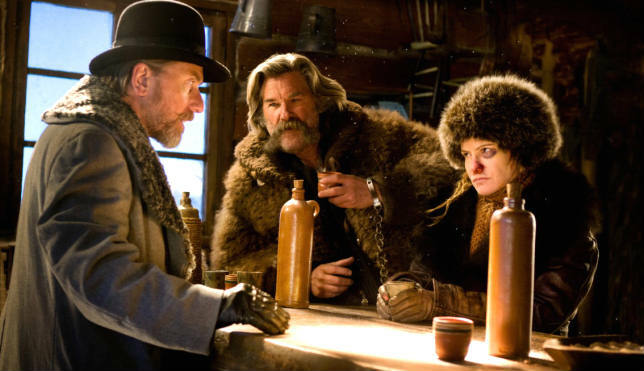 On board the stagecoach is another bounty hunter, John “The Hangman” Ruth (Russell) and his prisoner, Daisy Domergue (Leigh), heading for the town of Red Rock so she can face trial. Once bona fides are established between the two men, Warren is allowed to journey on aboard the stagecoach. Later they pick up another stranded man, Chris Mannix (Goggins), who tells them he’s also heading to Red Rock where he is to take up the post of sheriff. At Minnie’s Haberdashery, they find that an earlier stagecoach has taken shelter there, and there are four men waiting out the impending snowstorm. One is a Southern general, Sanford Smithers (Dern), who’s come to Wyoming in search of his missing son. Another is Joe Gage (Madsen), a cowboy heading home after being away on a lengthy cattle trail. The third introduces himself as Oswaldo Mobray (Roth), on his way to Red Rock to act as hangman should Daisy Domergue be found guilty at her trial. And then there’s Bob (Bichir), a Mexican who tells Warren that Minnie and her husband, Sweet Dave, have gone to see her mother, and that they’ve entrusted the upkeep of the staging post to him. But Warren is unconvinced. Once everyone is inside and introduced to each other, Ruth is quick to make it clear that he believes at least one person there isn’t who he says he is, and that it’s likely they’re going to try and free Daisy (though he doesn’t say why, or how he knows). Warren believes him, and they agree to join forces and keep an eye on the other men. But things begin to go wrong when Warren recognises Smithers, and he realises why the old man is there, and so far from home. The eighth movie by Quentin Tarantino is ostensibly a Western, but thanks to its writer/director’s penchant for being a movie magpie, it’s also a thriller, a revenge drama, an old dark house-style mystery, and yet another movie where he assembles a great cast only to give preference to some – Jackson, Russell, Goggins – while neglecting others – Leigh, Bichir, Madsen. 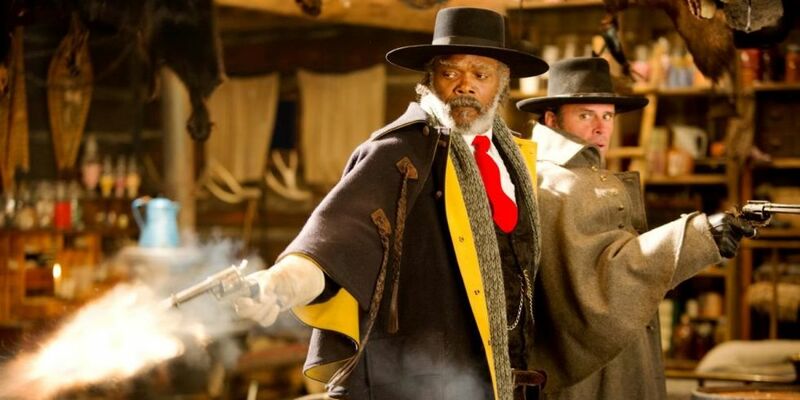 That Tarantino wants to stuff his movie with references to other movies has always been a part of his movie making raison d’être, so it shouldn’t come as any surprise that The Hateful Eight isn’t just a Western. But this time around, the end result is a movie that struggles to find its identity, and thanks to the novel-style approach of Tarantino’s script – it’s made up of six Chapters – it feels much more artificial than it should be. As Tarantino nudges along his characters in the wake of Jackson’s central character, and takes in issues of racism and post-War guilt, and a very occasional stab at the morality behind the execution of women, it becomes clear that these characters are mere cyphers, lacking in development and free from any real, appreciable insight into their motives. Given this lack of investment by Tarantino’s script, and despite the detailed and often hypnotic rhythms of the dialogue he grants them, it’s left to his very talented cast to make up the shortfall. Some achieve this with aplomb – Goggins in particular – but even the likes of Russell and Leigh can’t elevate the shallow nature of their characters. Russell bellows like an absurdist bully, while Leigh at one point is reduced to the kind of playground boasting that was outmoded even in the 1860’s. Spare a thought then for Tarantino regular Jackson. Having landed the lead role in the movie, and been given the kind of back story that most actors would relish getting their hands on (or teeth into), it must have been dispiriting to see the final product and realise that for all the blood and thunder involved, it was all for nought given how the character is treated in the movie’s final chapter. There’s a lot to be said for a movie of this length when it exposes some of its maker’s more crueller narrative decisions and forces its audience to wonder if its wunderkind creator is quite the impressive writer/director he’s reputed to be. And this is where The Hateful Eight is most successful: in showing that the hype surrounding Tarantino isn’t always deserved. Take one scene in particular, the beginning of Chapter Four, entitled Domergue’s Got a Secret. Unable to introduce a major plot development in any other way (apparently), Tarantino resorts to the use of an offscreen narrator (voiced by himself) who not only explains what Daisy’s secret is, but clearly signposts for those in the audience who may be hard of understanding, what this means in terms of what follows. It’s like someone stopping a theatre production of Macbeth and stepping forward to explain that when Shakespeare says Macbeth can’t be “killed by man born of woman” he actually means he can be killed by someone born via Caesarean. Got it? Then let’s move on. From there on The Hateful Eight swiftly unravels in a welter of violence and bloodshed that throws out all the groundwork made to get this far, and concentrates instead on bumping off its cast of characters. But any fascination or sympathy the viewer may have had for anyone is eroded by Tarantino’s decision to go for a bloodbath rather than a tense showdown. And then there’s the final chapter, so awkward and clunkily written that the viewer can’t help but wonder if Tarantino didn’t know how to end his movie, and settled on the first thought that came to him – and then didn’t even bother to polish the finished script. For once, Tarantino relinquishes control over the material, and the camerawork by Robert Richardson – up til then one of the few consistent positives about the movie – is undermined by the kind of reckless scissor-happy editing that you’d expect from someone having to deal with far less filmed material and an impossible deadline (and the movie’s editor, Fred Raskin, is a much better editor than that – check out his work on another 2015 Western, Bone Tomahawk, for proof). 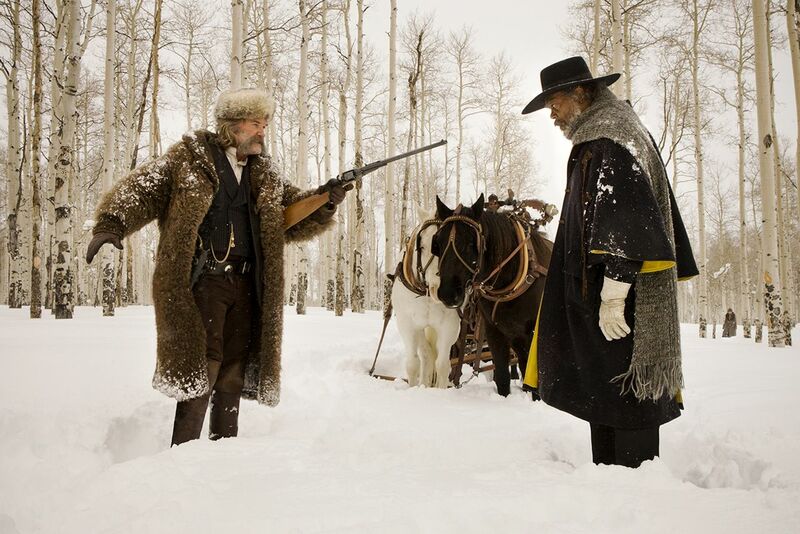 When all is said and done, The Hateful Eight isn’t a movie that works; at least, not entirely. If anything, the movie never proceeds to anywhere successful once Chris Mannix boards the stagecoach and they arrive at Minnie’s Haberdashery. Up til then, Tarantino does what he does best: he introduces his characters through his trademark intricate dialogue, and he sets the scene for the rest of the movie. But once in Minnie’s Haberdashery, the plot has to take over, and it soon runs out of steam. The addition of a flashback in Chapter Five feels even more awkward than the revelation that Daisy has a secret, and makes scant use of Channing Tatum into the bargain. And finally, as if to rub salt into the movie’s wounds, we have a score by Ennio Morricone that has no impact throughout, and isn’t in any way memorable (there are times when it doesn’t even feel suited to the material). When your favourite movie composer can’t even make a difference then you just know that it’s not going to work. Sometimes – and this applies to anyone who writes and directs their own movies, or who have carte blanche from the studio that writes the cheques – having an idea isn’t enough. And building on that idea isn’t enough. And writing a screenplay isn’t enough. Sometimes you just have to let an idea go. Often it’s the kindest thing you can do for everyone. 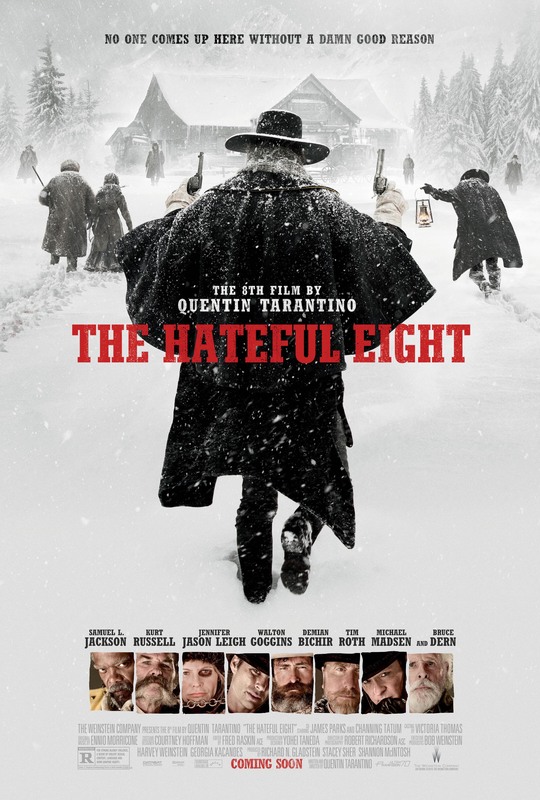 Rating: 6/10 – narrative glitches aside, Tarantino’s eighth movie proves lacklustre both in terms of its visuals and its attention to its characters, leaving the viewer without anyone to sympathise with or warm to; The Hateful Eight is also the first of the writer/director’s movies to feel incomplete in terms of his investment in the project, and while he may argue otherwise, there’s a distance between him and the final product that hasn’t been there in any of his other, seven movies. The quiet town of Bright Hope finds itself host to thief and murderer Purvis (Arquette). With his behaviour proving suspicious to town deputy, Chicory (Jenkins), Purvis’s attempt to resist arrest by the sheriff, Franklin Hunt (Russell) leads to his being shot in the leg and put in jail. Later the same night, while being tended by the town’s medic, Samantha O”Dwyer (Simmons), and guarded by young deputy Nick (Jonigkeit), the jail is attacked and the trio are abducted. When this is discovered the next morning, Hunt seeks advice from a local Indian scout as to who could have done such a thing, as a peculiarly shaped arrow was found at the scene. The scout is quick to tell Hunt that it’s the work of troglodytes, a flesh-eating “clan” that live in the nearby hills; he also tells Hunt he won’t go with him as any attempt to rescue the missing will be guaranteed to fail, and anyone who goes will die. Hunt has no choice but to go, as does Samantha’s husband, Arthur (Wilson), even though he recently broke his right leg and it’s still in a splint. John Brooder (Fox), the man who introduced the O’Dwyer’s to each other, feels obliged to go, and despite Hunt’s objections, Chicory insists on going as well. 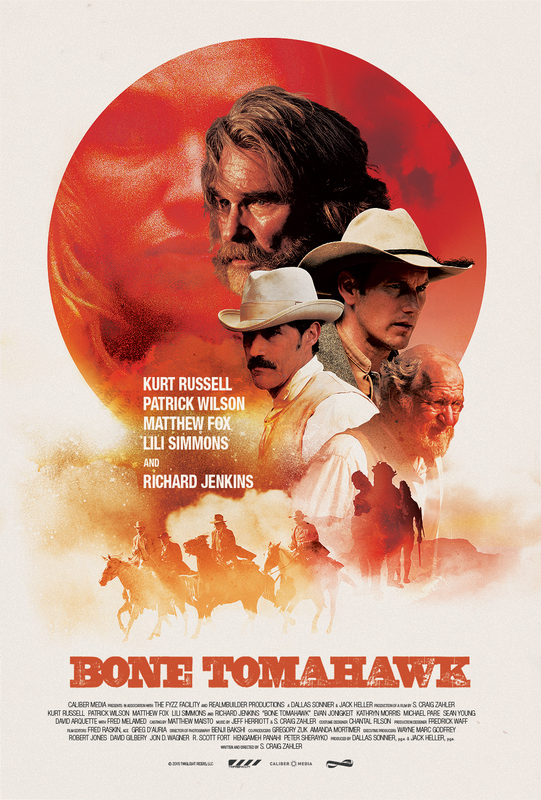 A strange, mercurial hybrid of Western and Horror, Bone Tomahawk is a movie that consistently outdoes its low budget in terms of originality, unexpected twists and turns in the narrative, and a recurring sense of humour that often threatens to undermine the seriousness of the drama, but which actually works as an escape valve for the tension that first-time director Zahler seems able to pull together at will. At times, this isn’t a movie for the faint-hearted or the squeamish – Nick’s fate is particularly gruesome – but in amongst the sometimes extreme violence and the matter-of-fact tone that accompanies it, Zahler manages to explore themes of masculinity, comradeship, loss, self-sacrifice, and most surprisingly of all, manifest destiny. From the outset, this is a Western that isn’t interested in telling a typical Western story, and although it bears a (very) basic resemblance to John Ford’s The Searchers (1956), it soon abandons any pretense at wanting to emulate that classic movie by taking a no-nonsense approach to the times, and the events that unfold. It also steers away from traditional Western motifs by having its quartet of lawful avengers put at a disadvantage right from the start, with O’Dwyer’s broken leg proving exactly the type of hindrance that’s likely to get them all killed. When they’re forced to leave him behind, not only does the size of their task increase, but also the likelihood of their ending up as buffet for the troglodytes increases too; they soldier on because they want to for each other, not because they have to for the abductees, which was how they set out. By changing this kind of stance along the way, and by making their opponents so animalistic as to be unreasonable, Zahler avoids any sentimentality that might occur in a regular Western, and isn’t afraid to put his characters through the wringer, so much so that there are times when the viewer isn’t sure if any of the quartet will survive, or if they do, how intact they’ll be. With a rugged, inhospitable looking backdrop to the action (expertly rendered by DoP Benji Bakshi), the main characters’ confidence is slowly eroded by their surroundings and the troglodytes’ uncompromising ferocity, and this is where Zahler’s ability to ratchet up the tension is most prevalent – how are they going to get out of this alive? It’s an interesting question, as by the movie’s end it’s not about the survival of the fittest, but survival at any cost. With so many weighty themes to incorporate, and with the violence and escalating tension proving so effective, it’s left to Jenkins’ daft, lovably clueless deputy to provide some much needed humour. There’s a lovely moment when he insists a travelling flea circus was operated by real live fleas, and he continually misunderstands things that have been said or done. Jenkins strikes just the right note of encroaching senility mixed with amiable foolishness and is a joy to watch as a result. Elsewhere, Russell’s flinty portrayal of Hunt will remind viewers of his turn as Wyatt Earp in Tombstone (1993), and his whiskers should by rights be given a movie of their own. It’s good to see him play a character who makes so many mistakes, and if he maintains a degree of unshakeable tenacity throughout, then the movie is all the better for it (even if it’s cruelly undermined by the troglodyte leader’s treatment of him). As the equally tenacious O’Dwyer, Wilson is headstrong, determined and completely focused on the task ahead, even though O’Dwyer will suffer for it. As his captive wife, Simmons is appealing and vulnerable, and more resigned to her fate than anyone would surmise. Both give credible performances and are matched by Fox’s belligerent martinet Brooder, a man as out of place in the quartet as he is oddly appealing. With Arquette and Morris (as Hunt’s wife) offering strong support, the movie benefits from having assembled a fine cast who are all committed to telling the tale at hand, and their are fine turns from the likes of Haig and Melamed in minor roles that add to the richness of the characters. With a low budget fixed in place, Zahler is forced to resort to some necessary sleight of hand in telling his story. The troglodytes’ cave is reduced to one static location that features little in the way of set dressing, and there’s a sense that the exterior scenes were all shot in the same place but from different angles to hide the repetition. There’s also a problem with the pace, as some scenes – notably those where Hunt et al travel to the hills – are flat and in need of tightening up. Otherwise, Zahler’s debut is a taut, gripping endeavour that breathes new life into a (mostly) moribund genre, and is a great way of announcing there’s a new director in town who’s definitely worth watching out for. 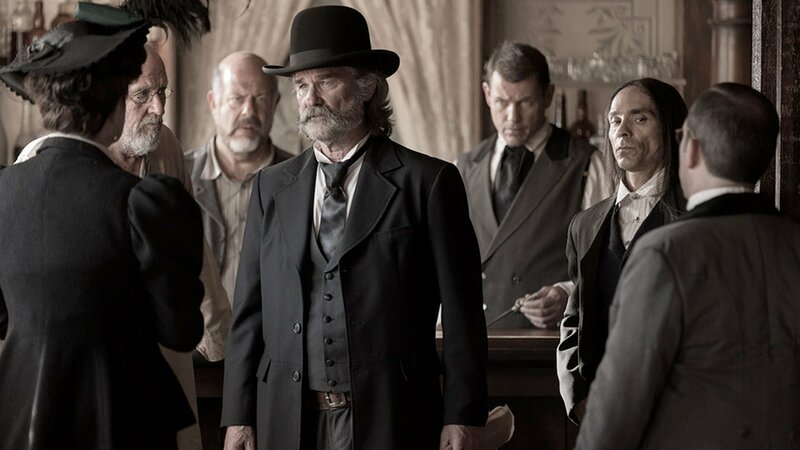 Rating: 8/10 – a surprise on so many levels, Bone Tomahawk is an uncompromising, unapologetic movie that revels in its ability to subvert the Western genre, and gives us a tribe of inbred cannibals that easily surpasses the cartoon equivalents in the Wrong Turn series; with a great cast clearly relishing their roles, and assured writing and direction from Zahler, this is meaty stuff indeed, and a rare treat.